You see it all of the time. Advertisements stating, “Sell My House for Cash” in Atlanta. You might be skeptical that someone can fork out so much cash for a house. Truth be told, it happens every day. You need to watch out for shady investors and consider all of your options. This article will deep dive what selling for cash means for you. How do I sell my house for cash? How do you even go about selling your house for cash to a home buying company like Breyer Home Buyers? Fill out the form below and submit your information. If we are a good fit, we will come out to the property and give you a cash offer for your house. After you accept the offer, we will open escrow on your property. We will have an inspection of the property. We bring in our contractors and they verify our repair list. After that, we line up our funds and set a closing date. You just show up to the closing table. What does a cash offer on a house mean? If you’re looking for a cash home buyer to buy my house, what kind of offer can you expect? Are you going to have to take a massive discount on the property to sell for cash? Am I Just Going to Receive a Low Ball Offer? People usually are afraid to contact investors. Sometimes an investor provides you with a discounted cash offer and doesn’t, or can’t, explain how they came up with it. If this happens, you should assume you’re being low balled. Always have the cash investor explain exactly how they came up with the numbers. This includes; all repairs, comparable homes, and costs to flip the home. If they refuse to explain this to you, or they pressure you, they don’t have your best interest at heart. We only want to work with homeowners who need and want our services. Our cash offers are no-obligation and no pressure. At Breyer Home Buyers, our formula is simple. We find similar, recently sold properties in your neighborhood. These are called comps, or comparable homes. We take the average ‘Sold’ price of the ones that best resemble your home. 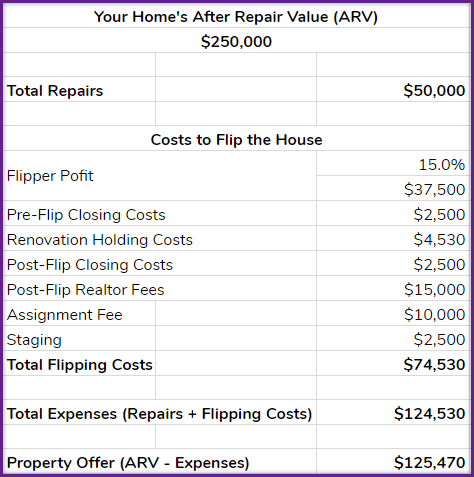 This lets us know how much we can sell the home for after we renovate it, or the After Repair Value. For this example, let us assume that number is $250,000. These properties also show us exactly what condition your home would need to be in to sell for $250,000. To bring your property condition to the same as the comps, we create a repair list. If you want to find out, on average, how much it will cost you to renovate your house, check out HomeAdvisor. 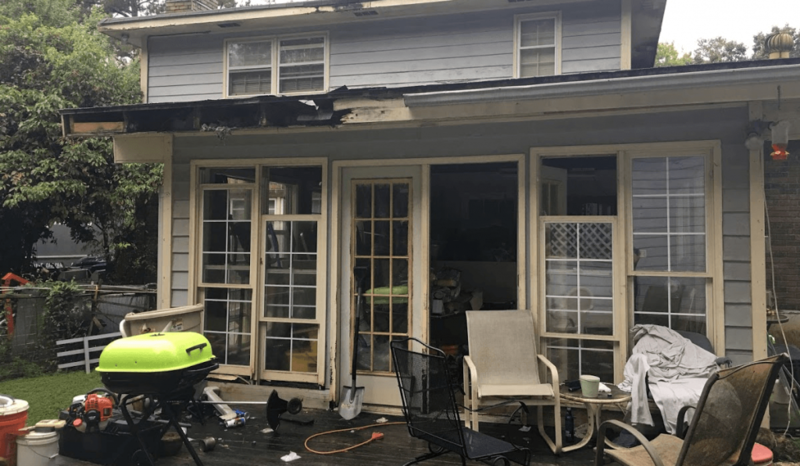 Let’s assume it’s going to cost us $50,000 in repairs to flip the home. We also will incur costs of business while flipping the home. This is business profits, holding costs, Realtor costs when we sell, closing costs, and staging costs. The costs of these are shown in the picture below. They come out to be $74,530 for a $250,000 house. This is how much it cost the flipper just to do the business of flipping. Now that we have all of our numbers, we can run our formula. With this formula and the numbers in the example, the offer would be as follows. Here’s the rundown of our property analysis for coming up with a cash offer. There are pros and cons with selling your house fast for cash. There several benefits to selling a house for cash in Atlanta. But why is a cash offer better for a seller over selling traditionally with a Realtor? It boils down to speed and convenience. A cash home buying company can get you out of your house in as little as 14 days. We also handle everything for you with minimal disruption to your life. Make repairs, spend money, and manage contractors. Keep the property very clean at all times. 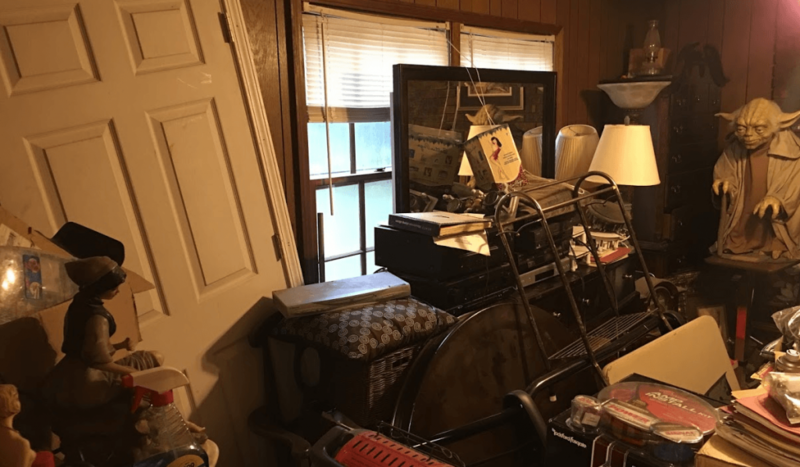 Declutter, depersonalize, and move extra stuff to storage units. Have your pets babysat during showings and open houses. Deal with the buyer’s lender and buyers that back out. Your house will take 1-6 months to close. Skip the cleaning and making repairs. Skip moving your extra stuff into a storage unit. Skip open houses and spur of the moment showings. Skip removing your pets (we love pets). Take the belongings you want when you move and leave the rest of them. Close and be done with your property within as little as 14 days. As with anything, when you sell your house to an investor, there are trade-offs. Yes, you are going to get a lower offer when compared to the price a Realtor can sell for. As you saw in the cash offer example above, we handle all of the repairs and renovations. We incur costs associated with flipping the home. In light of that, we have to get the property at a discount. 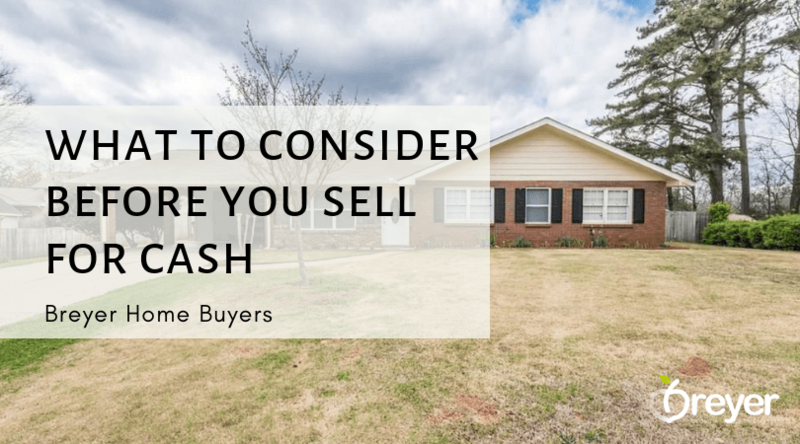 In the end, you are trading the money and time that you’d spend renovating, cleaning, staging, and selling your home for the speed and convenience that a cash home buyer offers. You literally get to walk away from your property and be done with it. Can You Sell a House As Is? When you hear “as-is” it literally means as-is. We bought a house with a tree in the roof, leaking water throughout the house for months. They used the insurance check for other pleasures. This caused the entire house to be filled with mold. The floors were warping several inches. The trusses for flooring and the roof was rotted. They had to quarantine themselves into the living room due to the dangers the rest of the home presented. We had to gut the entire house down to the studs. When we gave them the offer on the house, it was as is. They didn’t have to make one repair. They left all of their belongings that had molded and took only their clothes and belongings that meant something to them. They even left an old car that wouldn’t run in the back yard. We hired a team and rented dumpsters. Then we gutted the property. This proves two things; don’t be embarrassed about the condition of your home and only take what you want. This doesn’t mean these are the only types of houses we buy. This is just an extreme example to provide you with insight into what we’ve dealt with. How Quick Can a House Sale Go Through? If you need to sell your house ASAP, an investor might be the route to take. This article digs deep on how long selling your house will take. 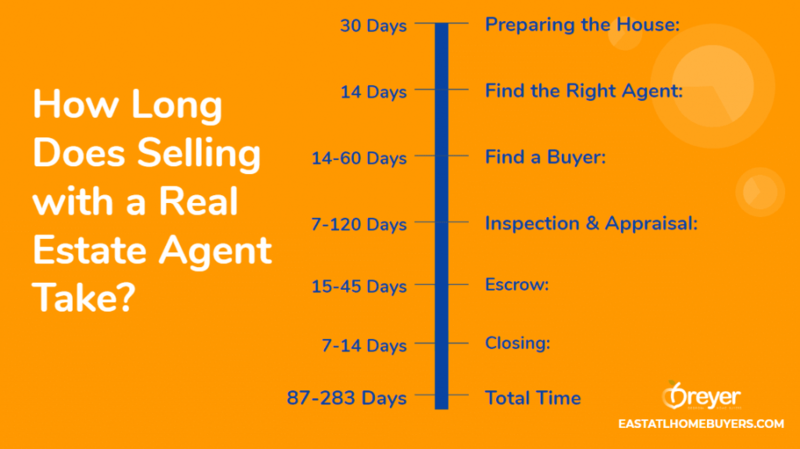 Selling with a real estate agent requires many steps. These steps, when combined, can take 87 – 283 days to close on your house and move out. Prepare the House: repairs, renovations, deep cleans, and staging. Find an Agent: research, vet, and meet with several agents to find the right one. Find a Buyer: list the property and wait for a qualified buyer to submit an offer. Inspection & Appraisal: scheduling 3rd party vendors, renegotiating repairs, and waiting on the appraisal. Escrow: waiting on the bank to do paperwork. Closing: waiting for the title company and all parties to get to the closing table. How Long Does a Cash Sale on a House Take? When you list with a Realtor, you may find yourself in a situation where your house won’t sell. If you’re wondering why your house won’t sell or what you can do if your house isn’t selling, maybe an investor is the route to go. 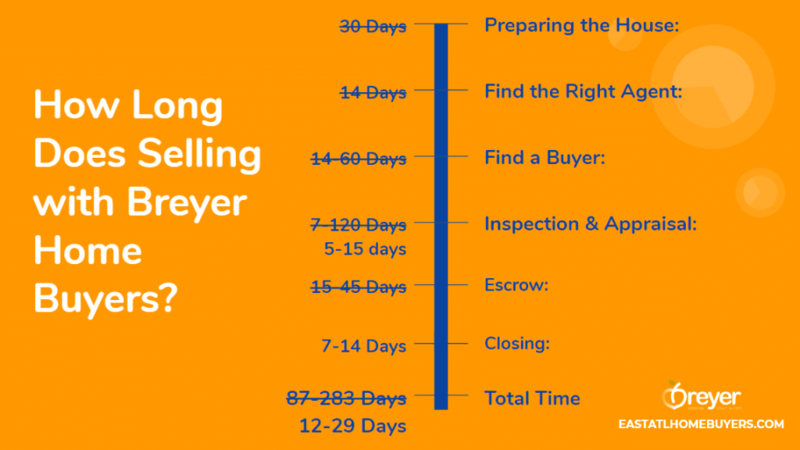 So if you want to avoid having your house sit on the market for several months, check out the timeline below to see how quickly you can sell your house with a cash home buyer like Breyer Home Buyers. Selling with an investor requires fewer steps when compared to an agent. These steps, when combined, can take 12 – 29 days to close on your house and move out. Find a Buyer: find a real estate investor that you trust. Inspection & Appraisal: investor and contractors verify the repairs and condition of the property. What is the fastest way to sell a house for cash? This article digs deeper into The Process of Selling a Home For Cash. If you choose to accept our offer, the closing can take place in a matter of days. With a direct sale to Breyer Home Buyers, you will avoid all costs of listing (repairs, commissions, closing costs, etc.) and be able to plan ahead by knowing exactly when the house will close. For many properties in Atlanta, a direct sale is a faster and more cost-effective solution. You will not need to make repairs or hire an agent in order to sell. Before you decide to list, find out if a direct sale is right for you! There is never any commitment!